The title of this series, Lingering Sentiments of a Late Collection of Genji (Genji goshū yojō), is actually a pun on The Fifty-four Chapters of the Tale of Genji (Genji gojūyojō). The British Museum curatorial files state: "... 38 diptychs plus one frontispiece comprising all the known designs from the series Genji goshū yojō (Lasting Impressions of a Late Genji Collection; 1857-61). Based on the serialized novel Nise Murasaki inaka Genji (A Country Genji by a Fake Murasaki; chapters 1-38, published 1829-42) by Ryutei Tanehiko, and its sequel Sono yukari hina no omokage (A Related Rustic Visage; chapters 39-61, published1847-64) by Tanehiko's followers. 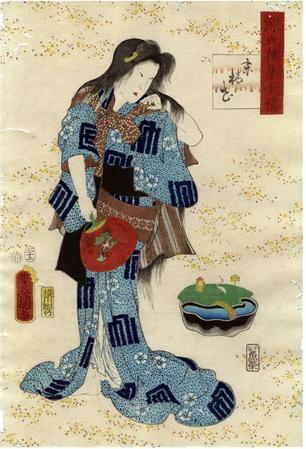 Both novels illustrated by Utagawa Kunisada (Toyokuni III)." Another example is illustrated and listed in Genji‘s World in Japanese Woodblock Prints by Andreas Marks, page 138.